Looking to buy a Barbados Real Estate oceanfront property for sale along the South Coast of Barbados? If the answer is yes, then this may be the one for you. Situated along one of the last and most beautiful Prime South Coast oceanfront locations in Barbados adjacent to the upmarket Atlantic Shores neighborhood, lies Seascape on Enterprise Coast Road - the perfect location for optional residential development of condos, townhouses, apartment building or hotel. 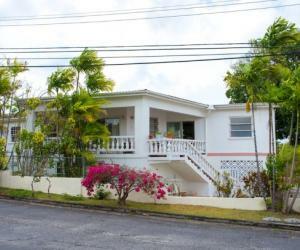 Seascape is a single story 4 bedroom, 2 bathroom Barbados house for sale. It features a large wrap-around front patio and purpleheart bedroom floors. Other accomodations include living/dining area, kitchen with breakfast area, laundry, maids quarters with bathroom, a terrace off the northern side of the patio and a storeroom. There is a detached double car garage that can easily be converted into a 1 bedroom cottage. In need of some refurbishment, it is now priced at the reduced price of US$900,000. Open to reasonable offers. Perfect for a residence or for residential development of condos, townhouses, apartment building or hotel.